Israeli citizen survives kidnapping attempt by Palestinian Arabs in jeep; perpetrators still at large. 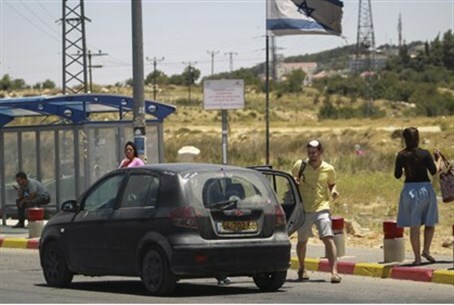 An Israeli citizen survived a kidnapping attempt from Palestinian Arab terrorists, he reported to police Wednesday night. The citizen, who remains unnamed, told local police that he was standing at a bus stop at the Alliance Intersection near Kiryat Arba when a jeep pulled up with one driver and one passenger inside. When the window opened, the would-be victim said, the two tried to thrust him into the vehicle before fleeing south. Following the report, police increased patrols in the area and the IDF secured the region and set up a makeshift checkpoint to check other suspicious vehicles. The would-be victim is uninjured. The kidnapping site is just north of the Alon Shvut intersection where Israeli teenagers Naftali Frankel, Gilad Sha'ar, and Eyal Yifrah, hy"d, were abducted and murdered earlier this year. Wednesday night's abduction follows an interview just hours ago in which the Chief of the IDF's Judea Brigade, Col. Yariv Ben-Ezra, stated to Arutz Sheva that the waves of terror in the region have begun to decline somewhat. "There is no doubt over the last two or three months, since 'Protective Edge,' that the terrorism trend is on the rise," Ben-Ezra said, noting that terrorism - like other trends - "rises and falls." "We see that practically [terrorism is rising] based on the number of attacks and stabbing incidents [recently]," he continued. "While over the past two to three weeks it has been on the decline, that does not mean it is not quiet." "We still have a lot to do, a lot to stop and prevent, but when you look at the whole picture we are relatively stable," he noted. "I hope it does not intensify with each attack, especially when the loss of life of a soldier or a civilian is terrible in and of itself." "We are preparing for extreme scenarios and escalation and that we will meet more complex challenges," he added. "The reality in Judea-Samaria over the years is a very complex and challenging [one]."